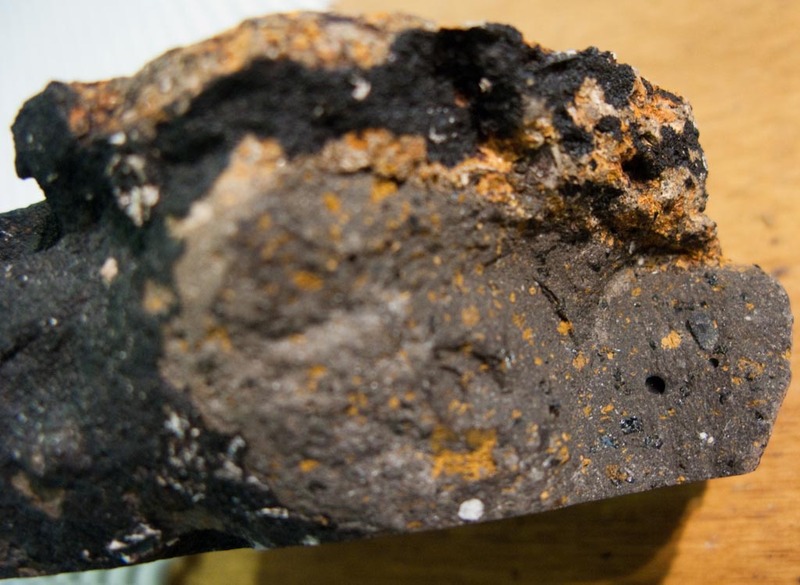 Part 2: Where can we find Potassium and Argon within Basalt? To find the argon we need for age dating rocks, we first need to find potassium. The rocks that we are dredging are volcanic basalts and contain on average 1% potassium by weight. This may seem like a small number, but is sufficient to yield a reliable age date for a rock. The potassium is found within the solid structure of the rock within large mineral crystals and the space in between those crystals, also called the groundmass. These minerals can be large or very small and this depends on many factors. Key among them is how fast or slow the rock cooled after its initial formation. The slower the rock cools, the larger the crystals tend to be within that rock and faster cooling generally yields smaller, more fine grained crystals. In basalts, a common thing we observe are larger crystals called phenocrysts set within a finer grained matrix made up of smaller crystals, also known as the groundmass. This is called a phorphyritic texture and is common in volcanic rocks. Before a volcanic event, the magma resides within a magma chamber at 5-10 km depth where it begins to cool and crystallize into solid phases. This process is slow and takes a long time, allowing crystals to grow large and generate nice crystal faces. When it is erupted as lava, the crystallization of phenocrysts is interrupted and the remainder of the lava cools quickly, forming the finer grained groundmass. Another common variety of volcanic rock contains only a fine crystalline groundmass and no large crystals. This is called an aphyric texture. The composition of these phenocrysts and the groundmass depends upon what kinds of elements were available in the magma that formed them. The basalts that we are examining, and basalts in general, contain five mineral phases, olivine, pyroxene, feldspar, oxides and matrix glass. This glass is a part of the groundmass and is the portion of leftover melt that doesn’t crystallize. The potassium needed for K/Ar dating can be found within the feldspar and glass phases. Other crystal phases exist that may contain potassium, such as biotite (a member of the mica family) and hornblende, but are a rare occurrence. When the dredge yields a rock that has a very crystalline groundmass or a portion of feldspar phenocrysts, or both, it is quite possible that we may be able to analyze it successfully to determine its age of eruption. Next time: the challenges of analyzing dredge samples from the ocean.